Small Kitchen College » Giveaway: The SKC BuiltNY Brown Bag Challenge! Giveaway: The SKC BuiltNY Brown Bag Challenge! It’s Brown Bag Week here on Small Kitchen College! We at Big Girls, Small Kitchen are big believers in the benefits of bringing your lunch with you to work (we have a whole chapter about “packing the quarter-life lunchbox” in our book!). Whether you love it or hate it, you know that come noon, instead of hungrily browsing SeamlessWeb or roaming the streets of the Midtown food desert, you could be sashaying to the company kitchen, taking out your brown bag, and revealing a mouth-watering, healthful, and well-rounded lunch. Starting today, we’re challenging all you post-grads starting first corporate jobs, undergrads doing summer internships, and office-bound “old hats” like our fellow twentysomethings to get in the habit of packing your lunch. All week we’ll be partnering with BuiltNY to give you tips, recipes, and giveaways about lunch on the go. Better yet, if you share your brown bag creations with us, you’ll have the chance to win some of the awesome lunch and bottle totes pictured above and below! We have a whole menu of events to come this week as part of the Brown Bag Challenge. Enter to win another slew of BuiltNY prizes on facebook and twitter by posting a picture of your brown bag lunch at any point this week. And make sure to join the conversation on Wednesday at Noon as we host our first-ever Live Twitter Chat with The Daily Meal, using the hash tag#brownbag. Become one of our official blogger sponsors by posting about your favorite lunchbox item and encouraging your readers to join the SKC Brown Bag Challenge! You can see the list of supporting bloggers in our What’s New section; be sure to come back and check out all the great dishes as links are added throughout the week! (Five Extra Entries) Write a blog post about your favorite brown bag lunch item and let your readers know about the SKC Brown Bag challenge! Leave a comment below with the url to your mention. We’ll also add you as one of our official blogger sponsors! Last but not least, check out our best-ever BGSK lunchbox menu, and tune in for many more great brown bag recipes to come from all the SKC contributors! I love packing a huge salad with lots of fresh veggies and a little something extra, like grapes or cilantro. Perfect for summer! Last night’s leftovers are also a nice treat. Leftovers are the best (today it’s arugula pesto potato salad with salt grilled chicken – both from Big Girls Small Kitchen! ), but I also love to pack a quick chickpea/lemon/parmesan/parsley salad. The protein from the chickpeas, the bite from the lemon, the saltiness of the parmesan – perfection! I LOVE sesame brown rice with shredded chicken and veggies. I love it more cold the next day for lunch than I love it for dinner. Which is a lot! I ALWAYS pack a lunch! I have ever since high school – I think it was a combination of being too hungry to wait in line, plus not finding foot long hotdogs to be very appetizing. Now that I’m a poor grad student, I pack a lunch to save money. And it’s a great way to use up leftovers from the night before that aren’t quite enough to get another full meal out of. I usually always have some kind of yogurt packed, and a piece of fruit. Lately I’ve been addicted to string cheese – nostalgic for my childhood? And my favorite sandwich lately is on a sandwich thin, with sliced cucumbers, mushrooms, sprouts, provolone cheese, hummus, and a little spicy mustard. Delicious! Wraps with lots of extra veggies are my absolute favorite thing to have mid-day! Favorite Brown Bag lunch: a blt wrap and fruit salad! I always look forward to lunch when I bring leftover pasta – for some reason, it always tastes better the next day! I am a fan of the classic PB & J on a whole wheat bagel thin! I love to add fresh strawberries, apples, green/red peppers, carrots, or cucumbers on the side. And… of course I can’t resist a few wheat thins. Just became a fan on facebook and subscribed to your email list! My favorite brown-bag lunch is spicy peanut noodles with a ton of veggies like cucumber, bell pepper, bean sprouts, cabbage and red onion thrown in. And a peach or plum on the side when they are in season! I normally bring leftovers for my brown-bag lunch. Today, I have leftover orecchiate pasta with a tomato-paste sauce and fesh herbs (basil, oregano, rosemary, pepper flakes) from my community garden. I alo threw in some leftover empanada meat (chorrizo and ground beef). It’s a multicultural fest in my mouth! I am an email subscriber. Thanks as always for your tips and recipes–my favorite blog and email newsletter!! I almost always pack my lunch, either with or without a reusable ice pack to keep it frosty. My simplest lunch is a roasted cashew butter and fruit preserves sandwich on Greenmarket bread with a Greenmarket apple and some other snack-cookie or pretzels. I even include my breakfast sometimes, if I don’t have time to eat before I leave–that’s usually a container of yogurt with berries and container of granola with almond slivers and flaxseeds. If I’m lucky enough to have leftovers, that’s the close second for lunch! i LOVE packing a really great salad i can toss together the night before…baby spinach as a base, sliced strawberries, sliced almonds (or another nut of choice), goat cheese crumbles, and broiled chicken. i just saw the curry chicken salad recipe and i can’t WAIT to make it! I enjoy the classic PB&J! My go-to lunch is typically some type of sandwich that is always accompanied by a piece of fruit. With the bounty at the local markets, my new favorite is a mozzarella, basil, and tomato sandwich, along with a fresh peach or berries on the side. I love brown bagging it! I pack hummus and fresh veggies, a berry medly of blackberries, blueberries, and raspberries, and then a yummy peach chobani greek yogurt for another little burst of protein! I love bringing dinner leftovers for lunch in my brown bag. Sometimes it’s a slice of lasanga, while other times it’s a salad with veggies from the nigh before. My coworkers always comment how I have tasty looking lunches! On today’s menu: curried chicken & apple salad (with plain non-fat yogurt instead of mayo), roasted brusel sprouts, and a peach for dessert. My favorite brown bag lunch is salad. It’s pretty quick and easy. the protein component is usually leftover meat from the dinner before, or if that’s not available, i keep packets of the shrink-wrapped teriyaki tofu around and then cut that in slices. I always supplement with yogurt and fruit. there are spare bags of microwave popcorn around for when i have a craving for chips. I also eat leftovers or whatever I found at the farmers market between bread or mixed with pasta. Today it was a fresh Purple Cherokee Tomato with mayo on bread, fresh carrots (with a bit of PB), and a peach. Yum!! Brown rice topped with chopped figs, crumbled blue cheese, sauteed swiss chard, and a topping of toasted almonds. Nutritious, balanced, and deliiicious! I just made an awesome brown bag lunch… a summer veggie wrap with a hard-boiled egg & spicy mayo! I’ve been craving one of these all winter and now that my farm-fresh produce is here, I knew I had to wrap it all up for lunch. The best part is that you can completely change it up every day depending on the veggies you have on hand. I posted about it at http://unspeakablevisions.blogspot.com/2011/07/brown-bag-challenge-summer-veggie-wrap.html. I am totally boring when it comes to brown bagging it, but recently, being in Germany with all these amazing breads has helped spice up my brown bag! I like to use all different kinds of crazy rolls, but then keep it simple with the inside (meat, cheese and some veggie toppings). A must for me is good snack packing in my brown bag. I like to munch during the day, so having raisins or almonds with me works well! My favorite brown bag lunch is a big Fuji apple, some medium cheddar cheese sticks and an egg salad sandwich with some apple juice to drink. I love turkey sandwiches with hummus, swiss, and tons of veggies. I also love baked chicken fingers with baked beans and BBQ sauce. Great easy lunches and pretty cheap too! My favorite is making couscous salads – you can add anything and everything to them! Today, I had pine nut couscous with grilled chicken, cucumber, redpepper, corn, black beans & mozzarella cheese. Delish, and great hot or cold! I’m a bit boring – turkey sandwich (sometimes a wrap to mix it up), fruit, veggie, morning snack, etc. Sometimes I feel like I’m packing for a little kid! My fav brown bag lunch lately is black forest ham and swiss on homemade bread with dijon mustard, lettuce and tomato (packed separately so the bread doesn’t get soggy), wavy potato chips, grapes and red pepper slices with yogurt dip. I’m a subscriber to the SKC newsletter. Hey ladies! I finally posted to my blog regarding this contest! I think you’ll find an interesting read and cute recipe. Not quite as awesome as y’all’s recipes, but yummy all the same Much love to y’all! It would probably help if y’all had my website, huh? Lol! Thanks for your time! my favorite brown bag lunch is when I make my pesto chicken sandwich. It’s a great way to use leftover chicken and add a gourmet feel to your sandwich. I normally have a jar of pesto, sun-dried tomatoes spread, and cheese in the frig. Just assemble and then heat up at work. Depending on what you have, its always nice to mix things up. Also in the summer time, I love to add cut watermelon cubes for the extra refreshing taste. Great idea, heard about it from Jess’ blog. I love just making a good, turkey sandwich. Cheddar cheese, lettuce, tomato and pickles make it so refreshing! Add some carrots and ranch on the side, and it’s PERFECT. whole wheat penne pasta with just a little olive oil, some mozzarella balls, cherry tomatoes sliced in half, and sometimes a little red onion or bell pepper diced up too! How many prizes are you giving out? What’s the chance of winning the prize? If you give me the prize first, sure, I will help you advertising on social networks for free. LOVE to pack a bunch of small bites = small portion sandwiches, chunks of cheese, fruits. Keeps it interesting and I can snack through the day. My favorite lunch lately is a spinach salad beast with carrots, tomatoes, red bell pepper, some sort of protein (either diced turkey or hummus) and homemade tahini dressing. On Sundays, I make a huge batch of cinnamon apple chips in the the dehydrator as dessert for weekday lunch. These always put a smile on my face no matter what my day is like! Loving the brown bag theme! I bring my lunch everyday and it’s nice to have new recipes to try and look forward to. Thank you! My son is contributing to the brown bag effort. He blended avacado, basil, Thai peppers, sweet peppers and onions a little salt and pepper to taste. And I use it ad a spread gor sandwiches and the like. Plus he is so happy because he grew everything but the avacados on our deck. I have almost worn out my built lunch bag, super cute and helps keep my portions smaller, has to fit in the bag. My favorite lunch to tote is a fresh greens salad with bean sprouts and marinated chickpeas and a red delicious apple. love your site and blog! One of my favorite lunches in a simple pasta with alfredo sauce and veggies like rotini with broccoli. Sometimes I’ll add chopped turkey or chicken. It’s a great easy lunch! Hard boiled eggs travel well and are great protein and with a small container or small plastic jar of Nance’s sweet and spicy mustard you can have deviled eggs for lunch. A simple squeeze from the bottle on top-take a bite and squeeze again and another bite and one more squeeze and last bite. Repeat with second egg. Refrigerate the leftover mustard for next time. Or another favorite is a can of delicious and healthy sardines (Moroccan spiced are a favorite). They all come with a flip top nowadays. A few Nairns oatcakes (in single packages of 6/pkg. )a few slices of sweet bread and butter pickles (in a spillproof container) and a couple of slices of provolone cheese. Make a stack of all these ingredients and repeat until gone. You won’t believe just how delicious they are together! This you may want to do again and again. Simple and very inexpensive lunch. A handful of fresh cherries, or grapes and you are good to go! My favorite brown bag lunch is probably a wrap of some kind. I love pasta tossed with whatever I have in the fridge–preferably veggies, maybe some beans, maybe some leftover pesto, maybe a few scraps of chicken or prosciutto, tomatoes, etc. Tossed all together with a bit of olive oil and some salt and pepper and it makes a great lunch, hot or cold! For a snack I always bring a some Greek yogurt or a banana. So easy. Great contest and I hope that I win! My favourite brown bag lunch is usually a filling salad that can be eaten cold. Mostly recently, I’ve been enjoying the bounty of summer vegetables in a Fattoush Salad. The veggies, zattar, lemony dressing and chicken really make for a filling and satisfying lunch. My favorite brown bag lunch typically includes many finger foods. I get incredibly busy at work and often can’t sit down and eat my entire lunch at once so I tend to cut up a ton of veggies and make my own dips to accompany them. For protein, I like to make a black bean salad – yum! I love packing greek salads for lunch! I enjoy a turkey sandwich with lettuce, tomato, avocado, and mayo on sourdough bread. Definitely leftovers, it’s the fastest route for me. I’d like to try more wraps and salads. Hands down, Mediterranean chicken kabobs with grilled onion and mint, with a side of greek salad. I bow before the altar of Bon Appetit, and this fills me up without being super heavy and giving me the energy to get through the rest of my business day. I love to bring wraps, or a loaded(lots of diff veges) salad with chicken or tuna. Also, sides of cucumbers, string cheese, or yogurt and maybe some corn chips. I subscribed to your newsletter and a “like” on facebook. 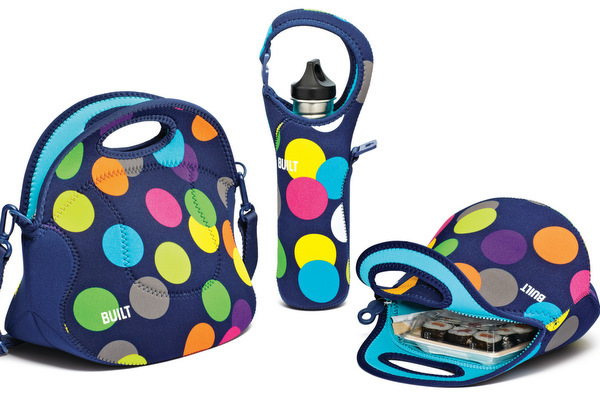 Love the styles of the bags, I like the beverage bags…I usually dont bring anything as a regular lunch box does not hold them. I pack my own lunch everyday to save money because I am a poor graduate student. I’m a simple girl with simple tastes and a turkey sandwich on whole wheat bread packed with lots of veggies does it for me!! My Favorite lunch is a few pieces of Boston lettuce, 2 – 3 slices of oven roasted deli turkey, 2 -3 slices of cheese ( I prefer provolone) and a small container of HOney mustard or guacomole as a spread. I then make lettuce roll-ups. YUmmy and healthy. For dessert, grapes or cherries in the summer. It’s all fresh, crispy and lite. I always make sure to keep some salad mix (Trader Joes is the best – super cheap) in my fridge and then I make an easy lunch salad with whatever leftovers I had the night before. Salmon…ground turkey…chicken…even a crumbled up veggie burger on top of lettuce is perfect for lunchtime. I live alone so I almost always have leftovers from the night before! Peanut Butter and Jelly Sandwich is my favorite brown bag lunch. I am a fan of Small Kitchen College on Facebook. Avocado and spinach sandwich with homemade sundried tomato hummus. That sweet but tartness from the sun dried tomato is so delicious with the creamy avocado! Yogurt, carrots, apple—quick, easy and delicious. I like going with the classic PB&J. You can’t go wrong with that! PB&J sandwich, an apple, and an Arizona Iced Tea. Nice, simple, and delicious! Never would have thunk I would find this so indispnelsabe. I like to stay well-rounded. I usually have veggies, fruit, grain, dairy, and some type of protein. The other day for work, I brought some lettuce, tomato, and pickles to put into a wheat pocket, along with some hummus! (I’m a vegetarian, and it’s a little harder to get protein, but hummus is very yummy, so it’s not really a problem anymore!!) I also had some cheddar cheese, blueberries, and cherries. It was really delicious and it kept me full all day! April Fool’s Guide~An essay for Saturday Writing Essential April 2011. Write about how our western forts resembled the castles of old times. Some old, some new, some splendid elegant structures, some just a ruin. that it can usually be taken in conjunction with other medicine you may be taking.